Q. What's the similarity between an elephant and a plum? A. They're both purple, except for the elephant. Q. What did Tarzan say when he saw elephants charging over the hill? A. "Here come the elephants!" Q. What did Tarzan say when he saw plums charging over the hill? Q. What did Tarzan say when he saw elephants wearing sunglasses charging over the hill? A. Nothing. He didn't recognize them. Q. What did Tarzan say when he saw giraffes charging over the hill? A. "Ha! You fooled me once with those disguises, but not this time!" Q. What is convenient and weighs 20,000 pounds? Q. What do elephants take when they get hysterical? Q. Why did the elephant fall out of the tree? Q. Why did the second elephant fall out of the tree? A. It was tied to the first elephant. Q. Why did the third elephant fall out of the tree? A. It thought it was a game. Q. Why did the tree fall over? A. It thought it was an elephant. Q. Why do you never see elephants hiding in trees? A. Because they're really good at it. Q. What do you get if you cross an elephant with a kangaroo? A. Big holes all over Australia. Q. What do you call an elephant that doesn't matter? Q. What's gray and white on the inside and red on the outside? A. An inside out elephant. Q. What's gray and white on the inside and red and white on the outside? A. Campbell's Cream of Elephant soup. Q. What did the grape say when the elephant sat on it? A. Nothing. It just gave a little wine. Q. What does an elephant smell like before he takes a shower? Q. What does an elephant smell like after he takes a shower? Q. What do you call an elephant riding on a train? Q. What happened when an elephant took the bus? A. The police made him give it back. Q. What's gray, has two tusks, and weighs 3,000 pounds? A. A statue of a walrus. Q. Why are elephants terrible dancers? A. Because they have two left feet. Q. How do you make a slow elephant fast? A. Take away all of his peanuts. Q. Why did all the elephants wear red sweatshirts? A. They were all on the same team. Q. What has twelve legs, is pink, and chants, "Na, na, na"? A. Three pink elephants singing "Hey Jude." Q. What's the best way to make an elephant sculpture? A. Take a block of marble and a chisel, and chip away anything that doesn't look like elephant. Q. Where do baby elephants come from? A. Really, really big storks. Q. Why is an elephant large, gray, hairy, and wrinkly? A. Because if it were small, white, hairless, and smooth, it'd be an aspirin. Q. Why did the elephant dry his dishes with a blue dish towel? A. Because they were wet. Q. Why were the elephants thrown out of the swimming pool? A. Because they kept letting their trunks down. Q. What kind of elephants live at the North Pole? Q. What did the river say when the elephant sat in it? A. "Well, I'll be dammed!" Q. How do you tell if there is an elephant in your bed? A. The big "E" on his pajamas. Q. How do you tell if there is an elephant under your bed? A. The ceiling is REALLY close. Did you like the anecdotes? Did you think they sucked? 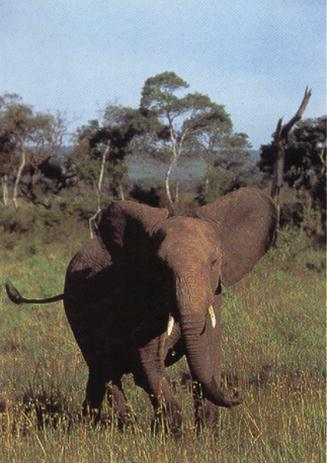 Have you had any elephant friends tell you some highly amusing anecdotes of their own? Let me know at doug.babcock@gmail.com.